Looking for International Coastal Cleanup? Sign up for a public cleanup near you. Many coastal communities in Connecticut and New York have stabilized their shorelines with bulkheads and concrete seawalls. While these structures are designed to barricade against rising waters and prevent erosion, they can end up causing unintentional harm. Disrupting the connectivity of land and sea fuels the loss of critical beach, dune, and marsh habitat—and threatens the safety of nearby communities, as hardened coastlines can fail to protect infrastructure from flooding during severe storms. When Hurricane Irene and Superstorm Sandy hit in 2011 and 2012, the vulnerabilities of our region’s coastal communities were exposed. In an effort to better prepare for catastrophic storms, both Connecticut and New York began to focus on natural techniques as a means of creating a more resilient shoreline. Fortunately, there are alternatives. Save the Sound advocates for and works to implement living shorelines, a coastal stabilization technique that uses natural materials like native salt marsh plants and hybrid alternatives to traditional hardened structures. This coastal management practice can restore, enhance, and maintain shoreline and marsh habitat, even while dissipating wave energy and mitigating flooding. Rebuilding marshes and dunes can help create more resilient coastlines that protect communities from rising tides and increasingly dangerous storms, while restoring critical ecosystem functions like filtering water and providing nursery habitat for birds and fish. In 2017, Save the Sound and the City of New Haven brought national attention to our largest living shoreline project to date: a massive living shoreline project at East Shore Park in New Haven. 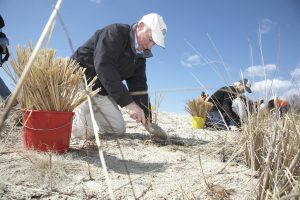 The team will be pursuing funding to support this project that, if constructed, would restore over half a mile of shoreline—improving access for local residents, restoring coastal habitat, and demonstrating what living shorelines look like in Connecticut’s unique coastal environment. Stay tuned!